Good Fortune Twice Per Day With 100 Free Spins! Do you happen to be the kind of player who is looking for wisdom every chance possible? Well, today we bring you witty advice about making a deposit of as little as $25 to play with up to 100 Free Spins! 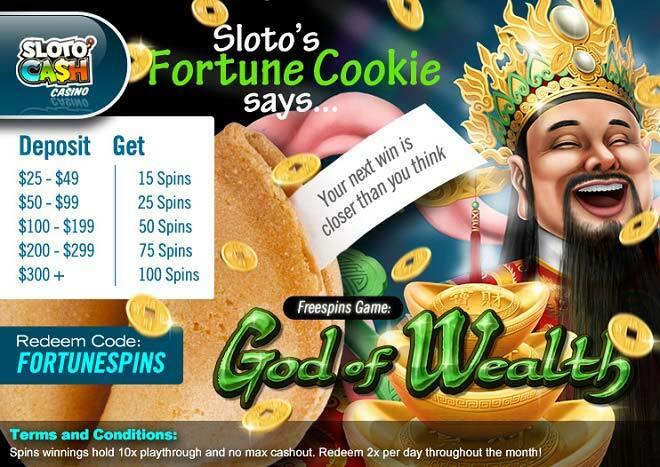 Your good fortune will begin the moment you spin the reels of God of Wealth to trigger the Free Spins bonus feature by landing the Gold Ingots! But the symbol to look out for is the God of Wealth icon, which triggers even more Free Spins with higher payouts! Consider September your lucky month the minute you deposit $25 which can bring you up to 100 Free Spins!